No event defines how rapidly America’s “leadership” has declined, then last night’s Academy Awards catastrophe. At which, one of its most prestigious accounting firms accidentally handed Warren Beatty the wrong “Best Picture” envelope, causing it to initially be awarded to the wrong movie. Yes, it was a “victimless crime” – but at a time when America’s accounting credibility is at an all-time low, it only adds to the perception of the incompetence that makes it unlikely to become “great again” any time soon. European TARGET II credit imbalances surged to levels last seen during the 2011 debt crisis, signaling imminent fear of a Eurozone breakup. Next, a series of disturbing, powers-that-be threatening news items from China. This, in the aftermath of Donald Trump telling a round table of U.S. manufacturers that foreign currency manipulation will not be tolerated, and deeming China the “grand champion” of currency manipulation. Starting with reports that at least one Chinese province has been serially, fraudulently overstating GDP by as much as 20%; followed by my personal favorite; i.e., Chinese crude oil import data suggesting OPEC is lying through its teeth about the “production cut” it agreed to in December. As if collapsing U.S. gasoline demand (down 5% year-over-year); the highest ever U.S. crude oil and gasoline inventories; and U.S. oil production and rig counts surging to multi-year highs aren’t evidence enough that said “production cut” is already dead on arrival. On this side of the pond, a record streak of “Dow Jones Propaganda Average” closes at new all-time highs, despite the worst fundamentals since the 2008 crises. In the last two days, due to prototypical PPT “hail mary” algorithms, which PPT co-conspirator JP Morgan insulted our collective intelligence by describing as hedge fund “rebalancing.” In Thursday’s case, despite significant NASDAQ losses; and Friday’s, per the premise of my must read “2.5% ‘Nuff Said – Revisited” article, as the benchmark 10-year Treasury yield closed at multi-month lows – not just suggesting, but screaming recession. Which by the way, this morning’s “unexpected” decline in January core durable goods orders decidedly validated. Meanwhile, Treasury Secretary Steve (“Goldman Sachs”) Mnuchin gave a press conference this weekend, in which he again backtracked on the timing of potential fiscal stimulus and tax reform policies. As, per what I espoused in my November 10th Audioblog, “Turning on Trump,” it becomes more and more obvious that NOTHING Trump hopes to accomplish is politically viable. Much less, with a potentially politically fatal debt ceiling debacle mere weeks away. And that goes double for the LOL, “repeal and replace” of Obamacare; which again, I said would NEVER happen, due to the catastrophic political ramifications. Which, as it turns out, were front-and-center topics this weekend, when the majority of State Governors were briefed of its impact. At which, they learned how millions of people would lose coverage under the House’s current “repeal and replace” proposal. Which, practically speaking, would sign their proverbial death warrants as Governors, if supported. Moreover, if the actual issues weren’t terrifying enough, the possibility of all-out Democratic Party civil war is now in the mix as well, following the highly controversial “election” of Tom Perez as the new DNC Chairman; who not only commenced a Twitter war with Donald Trump immediately, but catalyzed a “DemExit” movement within the party itself! Let’s get to the principal reason the Cartel is so (rightfully) “terrified.” Which is, a confluence of powerful technical indicators suggesting the end of five years of PM holders’ torture is not only over, but on the verge of shifting to bliss in the coming months and years. Before I get to such factors, I must emphasize my long-standing belief – based on irrefutable empirical data – that technical analysis is, for all intents and purposes, useless in rigged markets like Cartel-suppressed Precious Metals, PPT-supported stocks, Fed-supported bonds, “oil PPT”-supported crude, and ESF-“managed” currency markets. However, there’s a big difference between the short-term moves they can so easily “paint,” and the long-term trends that they not only can’t manipulate, but inadvertently cause. In large part, due to the fundamental changes such manipulations cause – like, for instance, plunging gold and silver inventories and production, and surging physical demand. Gold’s 200 WEEK moving average of $1,260/oz; and silver’s, at $18.59/oz. Both of which, the Cartel is desperately “defending.” And by the way, I apologize for in recent articles erroneously referring to them as 200 MONTH moving averages; which by the way, are for all intents and purposes, “irreversibly bullish” at $892/oz and $15.05/oz, respectively. As you can see in these excellent charts from Steve St. Angelo, both metals traded above their 200 week (i.e., four-year) moving averages from 2002-03 through 2013, with the exception of silver during the height of the 2008 financial crisis. During which, I might add, physical premiums surged to 100% due to the crippling shortage the Cartel’s paper smashing catalyzed. Which in essence, depicts a silver market that did NOT trade below its 200 week moving average in practical terms. However, the damage done by the vicious Cartel attacks that commenced in September 2011 – which I have since deemed its “point of no return” – dramatically weakened gold and silvers’ momentum in the ensuing years, culminating in the most blatant Cartel attack since May 2011’s “Sunday Night Paper Silver Massacre.” When, on Friday April 12th and Monday, April 15th, 2013 – one day after an unprecedented “closed door meeting” between Obama and the top “too big to fail” bank CEOs on April 11th – Precious Metal prices, for no apparent reason, violently collapsed in what I have since deemed the “alternative currency destruction” raids. 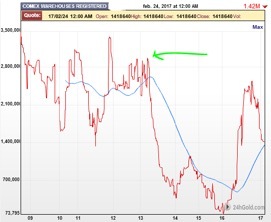 Which not only catalyzed a physical silver shortage second only to the 2008 scenario, but a long-term run on global physical inventories – like at the COMEX, which has since seen more than 50% of its “registered” (i.e. available for sale) gold since disappear. In other words, the real reason for said raids had nothing to do with speculation about, LOL, the “exit strategy” from its $4.5 trillion balance sheet the Fed was publicly propagandizing; which, four years later, is still $4.5 trillion. To the contrary, its sole aim was to “finish off” the technical damage inflicted on PMs since 2011, by pushing them below their respective 200-week moving averages. Which in hindsight, bought them a mere four more years of world-destroying capital market manipulation, setting the stage for the irreversible – and catastrophic – political, economic, social, and monetary hell the world is entangled in today. Which, given the aforementioned confluence of historically “PM bullish, everything-else-bearish” fundamentals, makes today, perhaps, the best buying opportunity in modern financial times. Thank you Andy for another excellent update. I don’t know when the manipulation will end, but when it does the whole world will feel it! They should have let this mess crash (reset) in 2008 because it would not have been as extreme as it will be now. I think folks have let up on being prepared with the win by President Trump, but that is a false feeling. Folks need to stay prepared and also get all the gold and silver that they can. Did the Netherland government vote to debate exiting the EU? My understanding is that they voted to investigate the feasibility of exiting the euro.